"An elaborate plan": rehearsal snapshots with Cynthia Hopkins & co.
Not only do they need to tailor it for the Walker’s stage, but since it’s a world premiere, those final details are innumerable: Does Cynthia throw the record here? Are the slides in the right order? Can the mike stand be steady? Not to mention other, bigger questions. 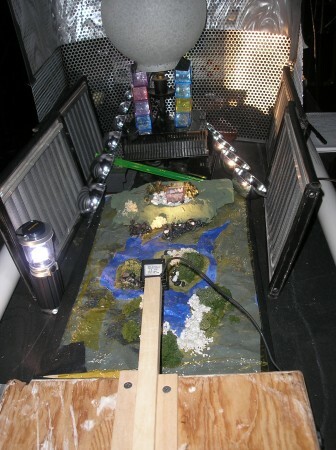 Above are views from the front and side of the stage. 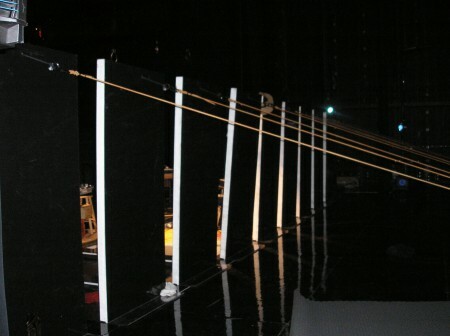 Those roughly door-sized panels are held up with long bungees, to define a smaller, intimate stage. During the first part of the show, they are dropped down, creating a shiny black void for the outer-space setting. 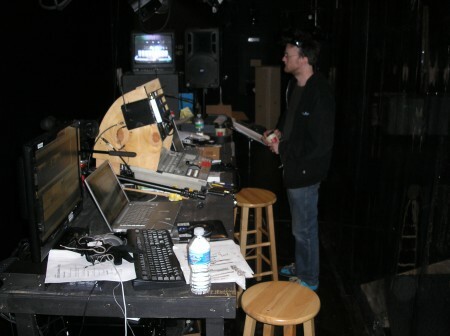 Below is Jeff Sugg working backstage – sort of. He and Jim Findlay, the design/tech geniuses behind all of Cynthia’s shows, are actually visible for part of the show (when the panels up above are not raised), working their magic behind a shiny clear sheet of plastic. A transparent take on the Wizard of Oz, if you will. 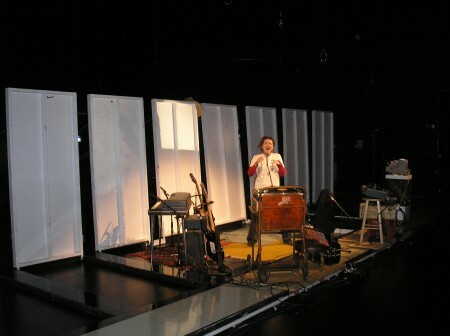 At certain junctures, they leave the computers and control boards and come forward as performers, to boot. Below: This crazed craft project is one of the many ways that Findlay and Sugg mix high- and low-tech. It’s a tiny model of, as Jim says, “the earth 50 million years from now” (or maybe that’s billion), with some new and no doubt highly evolved improvements. Attached to that wood strip in the center is a mini-camera that can do tracking shots over the landscape, which are projected onto a really cool curved screen hanging high over the main stage. If you look for it, I think this might be visible during the show, in back with Jeff and Jim and all their gear. Overall, there’s an intriguing mix in this show between homespun design and expansive elegance. I’m eager to see how it all comes together on Thursday night.